It's too bad Mars is such an interesting place, because it's actually one of the most difficult places to visit in the solar system, especially if you want to bring along a lot of luggage. That planet is a graveyard of missions that didn't quite make it. As our ambitions grow, and we think about exploring Mars with humans – maybe even future colonists – we're going to need to solve one of the biggest problems in space exploration: Successfully landing heavy payloads on the surface of Mars is really, really hard to do. There are a bunch of challenges with Mars, including its lack of a protective magnetosphere and lower surface gravity. But one of the biggest is its thin atmosphere of carbon dioxide. If you were standing on the surface of Mars without a spacesuit, you'd freeze to death and asphyxiate from a lack of oxygen. But you'd also experience less than 1 percent the atmospheric pressure you enjoy here on Earth. And it turns out, this thin atmosphere is making it incredibly challenging to get significant payloads safely down to the surface of the Red Planet. In fact, only 53 percent of missions to Mars have actually worked out properly. So let's talk about how missions to Mars have worked in the past, and I'll show you what the problem is. Historically, missions to Mars are launched from Earth during the flight windows that open up every two years or so when Earth and Mars are closer together. ExoMars flew in 2016, InSight in 2018, and the Mars 2020 rover will fly in, well, 2020. The missions follow interplanetary transfer trajectory designed to either get there the fastest, or with the least amount of fuel. As the spacecraft enters the atmosphere of Mars, it's going tens of thousands of kilometers per hour. Somehow, it has to lose all that velocity before landing gently on the surface of the Red Planet. Here on Earth, you can use the thick Earthican atmosphere to slow your descent, bleeding off your velocity with a heat shield. The space shuttle's tiles were designed to absorb the heat of re-entry, as the 77 tonne orbiter went from 28,000 km/h to zero. A similar technique could be used on Venus or Titan, which have thick atmospheres. The moon, without any atmosphere at all, is relatively straightforward to land on, as well. Without any atmosphere, there's no need for a heat shield; you just use propulsion to slow your orbit and land on the surface. As long as you bring enough propellant, you can stick the landing. Back to Mars, with a spacecraft hurtling into its thin atmosphere at more than 20,000 kilometers per hour. Traditionally, missions have started their descent with an aeroshell to remove some of the spacecraft's velocity. 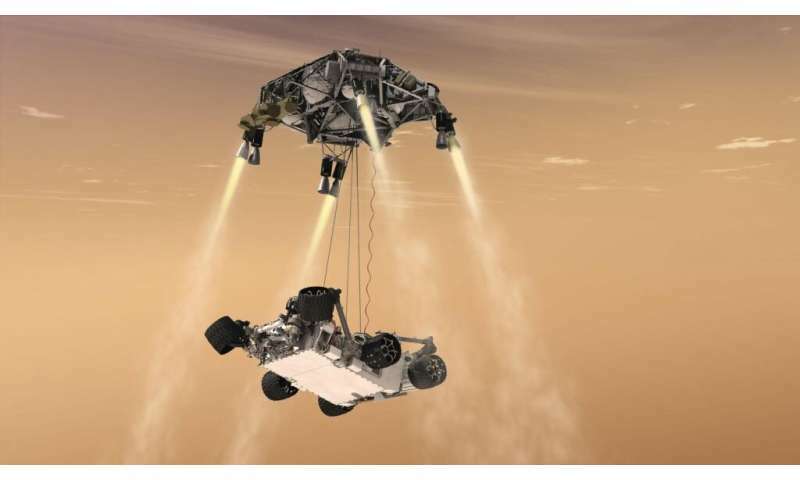 The heaviest mission ever sent to Mars was Curiosity, which weighed in at 1 metric tonne, or 2,200 pounds. When it entered the Martian atmosphere, it was going 5.9 kilometers a second, or 22,000 kilometers an hour. Curiosity had the largest aeroshell ever sent to Mars, measuring 4.5 meters across. This huge aeroshell was tilted at an angle, allowing the spacecraft to maneuver as it hit the thin atmosphere of Mars, aiming for a specific landing zone. At about 131 kilometers altitude, the spacecraft would start firing thrusters to adjust the trajectory as it approached the surface of Mars. After about 80 seconds of flight through atmosphere, the temperatures on the heat shield rose to 2,100 degrees Celsius. To prevent melting, the heat shield was made with a special material called phenolic impregnated carbon ablator, or PICA, the same material SpaceX uses for its Dragon Capsules. Once it had slowed its velocity to lower than Mach 2.2, the spacecraft deployed the largest parachute ever built for a mission to Mars – 16 meters across. This parachute could generate 29,000 kilograms of drag force, slowing it down even more. The suspension lines were made of Technora and Kevlar, which are pretty much the strongest and most heat-resistant materials we know of. Then it jettisoned its parachute and used rocket engines to slow its descent even more. When it was close enough, Curiosity deployed a skycrane that lowered the rover down gently to the surface. This is the quick version. If you want an extensive overview of what Curiosity went through landing on Mars, I highly recommend you check out Emily Lakdawalla's The Design and Engineering of Curiosity. Want to do the same thing with heavier payloads? I'm sure you're imagining bigger aeroshells, bigger parachutes, bigger skycranes. 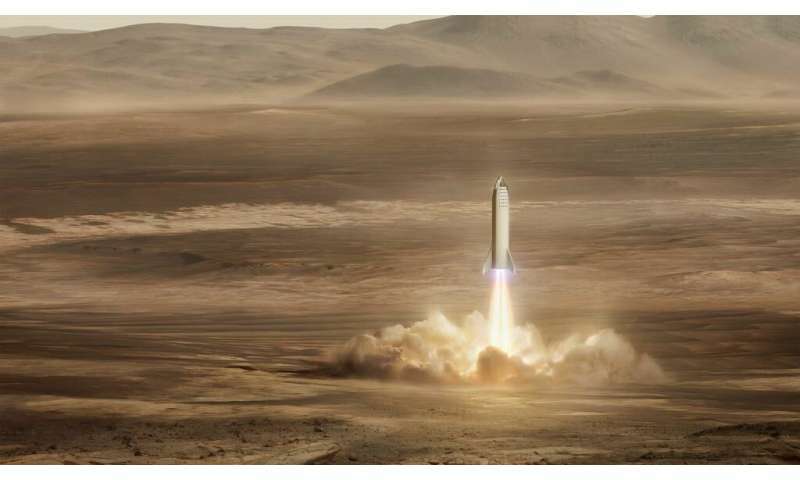 In theory, the SpaceX Starship will send 100 tonnes of colonists and their stuff to the surface of Mars. Here's the problem. The methods of decelerating in the Martian atmosphere don't scale up very well. First, let's start with parachutes. To be honest, at 1-tonne, Curiosity is about as heavy as you can get using a parachute. Any heavier, and there just aren't any materials engineers can use that can handle the deceleration load. A couple of months ago, NASA engineers celebrated the successful test of the Advanced Supersonic Parachute Inflation Research Experiment, or ASPIRE. This is the parachute that'll be used for the Mars 2020 rover mission. 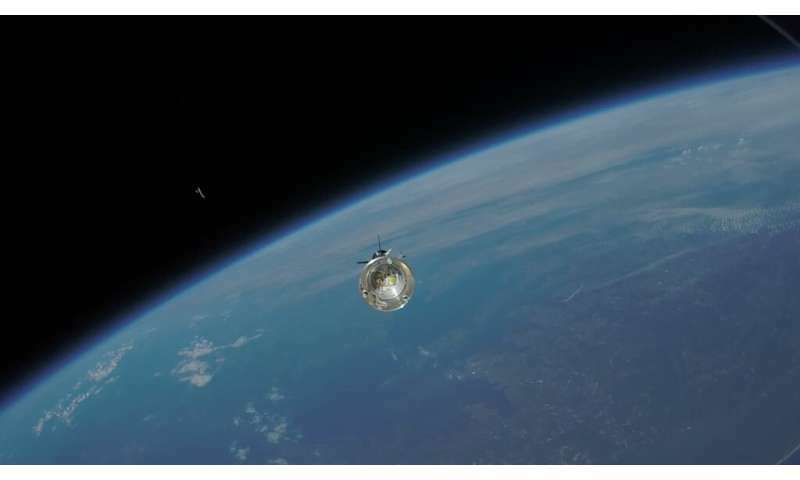 They put the parachute made of advanced composite fabrics like nylon, Technora and Kevlar, onto a sounding rocket and launched it to an altitude of 37 kilometers, mimicking the conditions the spacecraft will experience as it arrives at Mars. The parachute deployed in a fraction of a second, and when fully inflated, experienced 32,000 kilograms of force. If you were on board at the time, you would experience 3.6 times as much force as crashing into a wall going 100 km/h wearing your seatbelt. In other words, you wouldn't survive. If the spacecraft was any heavier, the parachute would need to be made of impossible composite fabrics. And forget about passengers. NASA has been trying out ideas to land payloads as much as 3 tonnes on Mars. 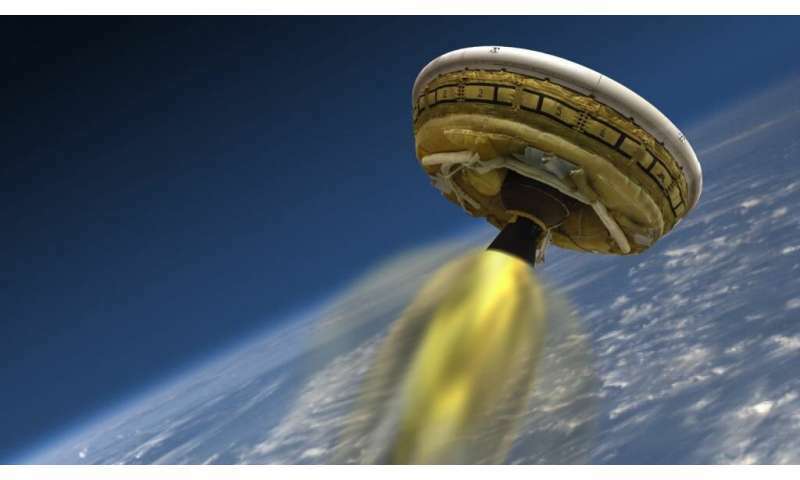 One idea is called the Low-Density Supersonic Decelerator, or LDSD. 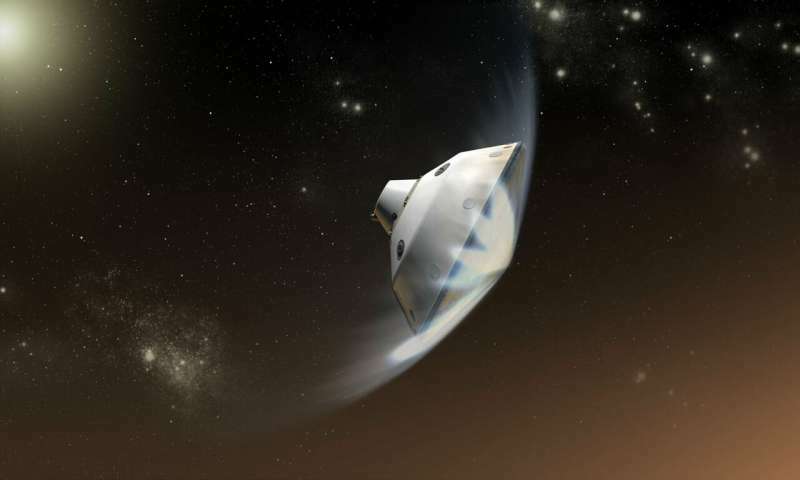 The idea is to use a much larger aerodynamic decelerator that would inflate around the spacecraft like a bouncy castle as it enters the Martian gravity. In 2015, NASA actually tested this technology, carrying a prototype vehicle on a balloon to an altitude of 36 kilometers. The vehicle then fired its solid rocket, carrying it to an altitude of 55 kilometers. As it was rocketing upward, it inflated its Supersonic Inflatable Aerodynamic Decelerator to a diameter of six meters (or 20 feet), which then slowed it back down to Mach 2.4. Unfortunately, its parachute failed to deploy properly, so it crashed into the Pacific Ocean. That's progress. If they can actually work out the engineering and physics, we could someday see three-tonne spacecraft landing on the surface of Mars. Three whole tonnes. The next idea to scale up a Mars landing is to use more propulsion. In theory, you can just carry more fuel, fire your rockets when you arrive at Mars, and cancel all that velocity. The problem, of course, is that the more mass you have to carry to decelerate, the less mass that you can actually land on the surface of Mars. 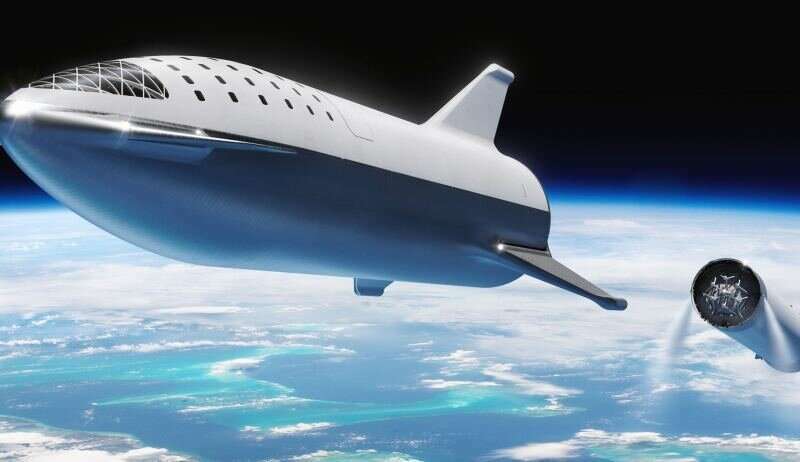 The SpaceX Starship is expected to use a propulsive landing to get 100 tonnes down to the surface of Mars. Because it's taking a more direct, faster path, the Starship will hit the Martian atmosphere faster than 8.5 km/s and then use aerodynamic forces to slow its entry. It doesn't have to go this fast, of course. The Starship could use aerobraking, passing through the upper atmosphere several times to bleed off velocity. In fact, this is the method that orbital spacecraft going to Mars use. But then passengers on board would need to spend weeks for the spacecraft to slow down and go into orbit around Mars, and then to descend through the atmosphere. According to Elon Musk, his delightfully unintuitive strategy for handling all that heat is to build the spacecraft out of stainless steel, and then tiny holes in the shell will bleed methane fuel out to keep the windward side of the spacecraft cool. Once it sheds enough velocity, it'll turn, fire its Raptor engines and land gently on the surface of Mars. Every kilogram of fuel the spacecraft uses to slow its descent to the surface of Mars is a kilogram of cargo that it can't carry to the surface. I'm not sure there's any viable strategy that will easily land heavy payloads on the surface of Mars. Smarter people than me think it's pretty much impossible without using enormous amounts of propellant. That said, Elon Musk thinks there's a way. And before we discount his ideas, let's watch the twin side boosters from the Falcon Heavy rocket land perfectly together. And pay no attention to what happened to the central booster. A new study from the Aerospace Department at the University of Illinois at Urbana-Champaign proposes that missions to Mars could take advantage of the thicker atmosphere that's closer to the surface of Mars. 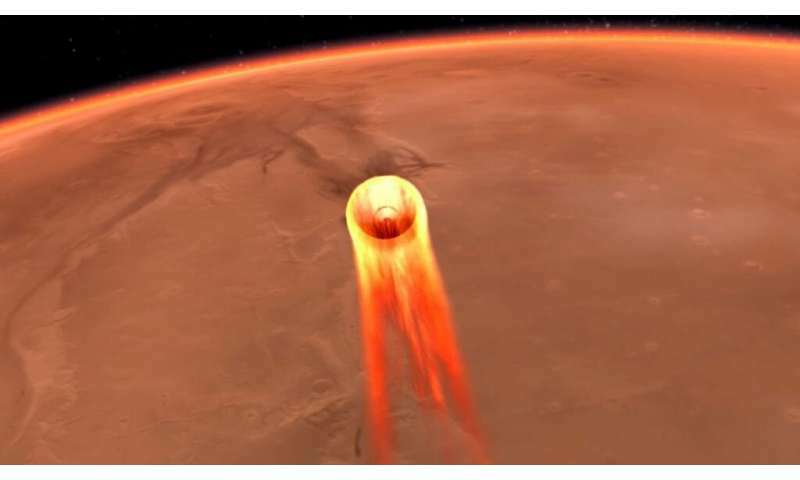 In their paper titled "Entry Trajectory Options for High Ballistic Coefficient Vehicles at Mars," the researchers propose that spacecraft flying to Mars don't need to be in such a hurry to get rid of their velocity. As the spacecraft is screaming through the atmosphere, it'll still be able to generate a lot of aerodynamic lift, which could be used to steer it through the atmosphere. They ran the calculations and found that the ideal angle was to point the spacecraft straight down and dive toward the surface. Then, at the last possible moment, pull up using the aerodynamic lift to fly sideways through the thickest part of the atmosphere. This increases the drag and lets you get rid of the most amount of velocity before you turn on your descent engines and complete your powered landing. If humanity is going to build a viable future on the surface of Mars, we're going to need to crack this problem. We're going to need to develop a series of technologies and techniques that make landing on Mars more reliable and safe. I suspect it's going to be much much more challenging than people are expecting, but I'm looking forward to the ideas that will be tested in the coming years.